When it comes to decorating, I find any excuse to do it! Especially when color is involved. Our style around the house is pretty simple, modern and classic. Lots of whites, grays, and blacks with random pops of color. So when there’s a holiday approaching, I love to get creative and crafty. I really enjoy walking around Hobby Lobby or Michaels to brainstorm and get ideas. 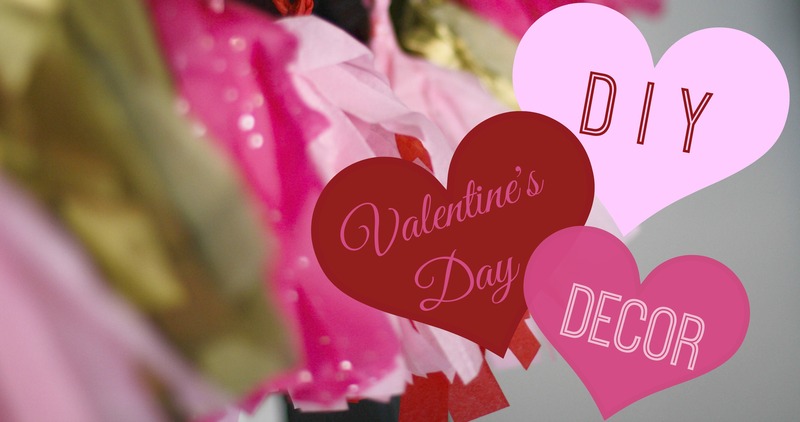 These DIY Valentine’s Day decorations are a combo of those ideas and Pinterest, of course. I’m not big into pink typically, but I love that February pushes me to use it. 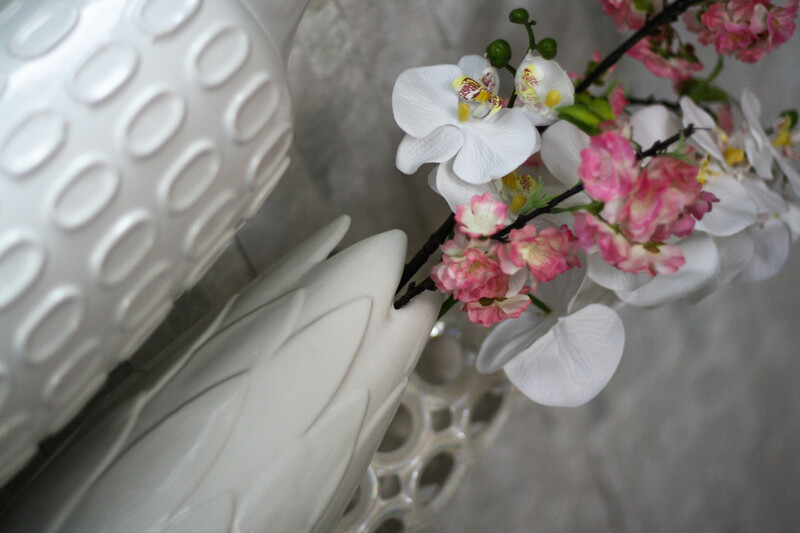 It makes me feel like spring is around the corner…which makes me a happy lady! 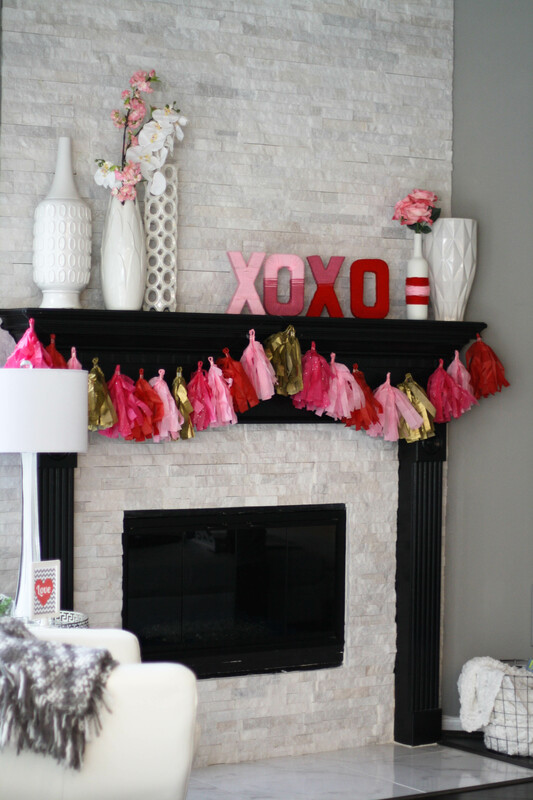 I’ve always adored the tissue paper tassel garland and what better spot to put it than the mantle! I followed this simple tutorial with a few supplies and had this fun, colorful product as a result! 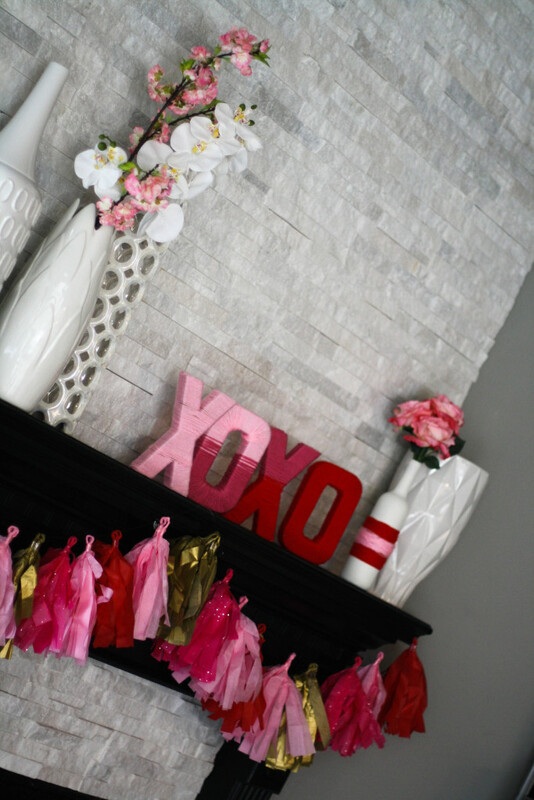 The “XOXO” is in an ombre pattern, which is great. 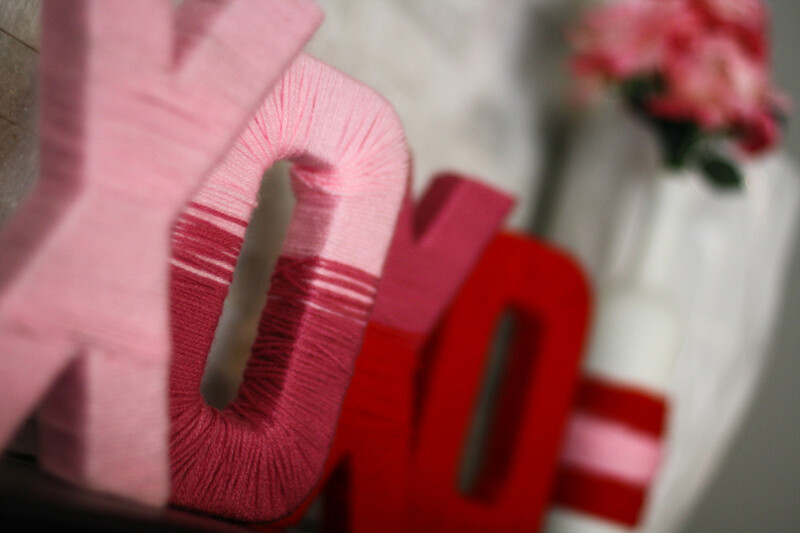 I found these paper mache letters at Hobby Lobby and I definitely see more projects with them! LOVE! LOVE! LOVE! They’re super versatile! Start at the bottom and glue one end of the yarn onto the letter. Once that has dried, wrap the entire thing until it’s covered. Glue the end of the yarn to the letter and that’s it! Super simple! Get to a well-ventilated spot outside and evenly spray the paint onto the bottle. Once it’s completely dry, glue the end of the yarn to whichever part of the bottle you’d like to be the back (look for paint drips/spots/etc). Wrap it until your heart’s content and glue the end of the yarn to the same section as the first piece. Voila! Done! 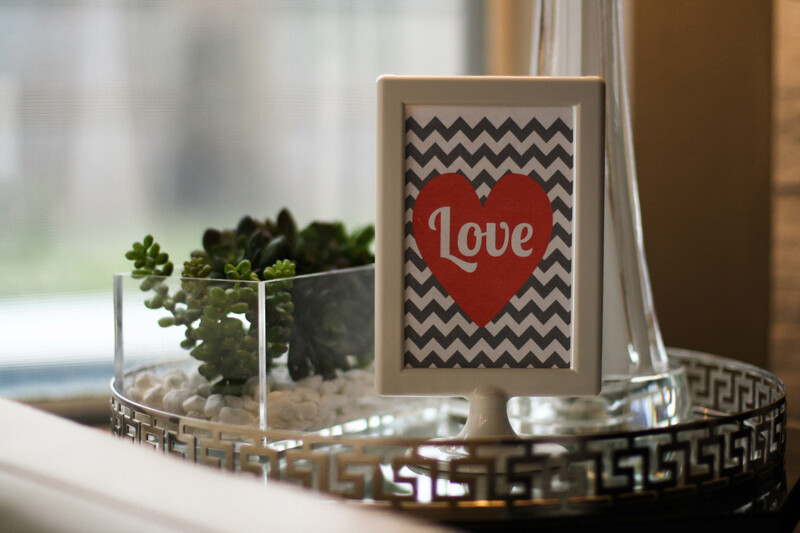 Looking for a free Valentine’s Day printable? Pinterest is my “GO-TO” for all printables! There are hundreds to choose from. This girl has super cute ones here! I printed mine out and added it to this frame from Ikea. 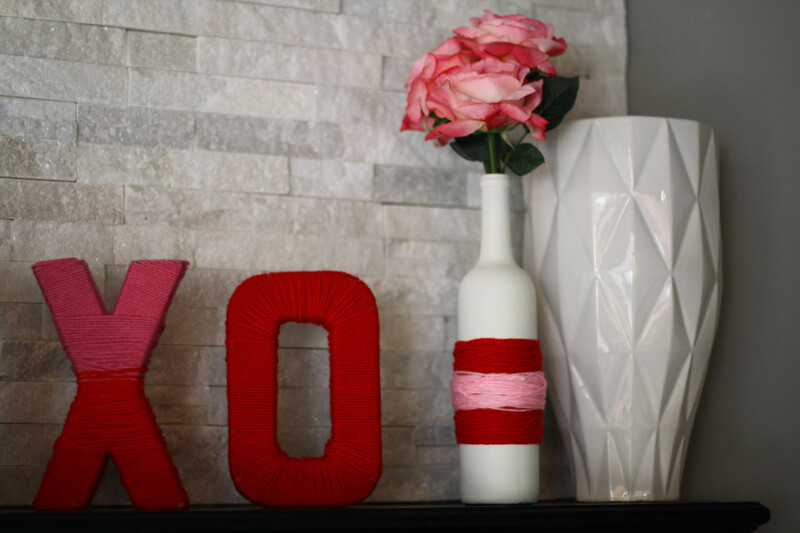 I hope y’all have as much fun as I did creating all these bright and cheerful Valentine’s Day decorations! Happy crafting, friends!